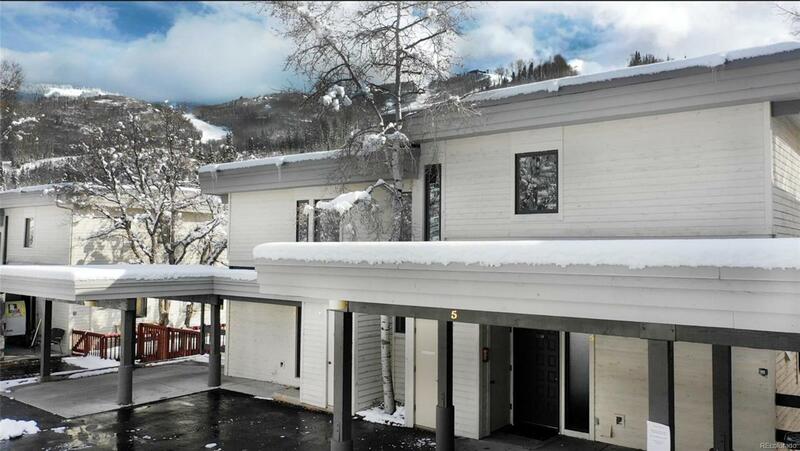 True Ski In/Ski Out Storm Meadows Phase I townhome offering the best location in the complex for access to the slopes. With a balcony on each level facing the mountain, this creates a peaceful and private oasis to enjoy the views year-round. An attached carport will protect your car and the shuttle service can whisk you around town during your stay. This 4 bed/3 bath provides enough space to host all of your loved ones, with plenty of room to spread out. Entertaining made easy thanks to the open floor plan from the spacious kitchen to the dining room and living room. Natural light floods into the living space from the deck's sliding doors and highlights the units updated stacked stone fireplace. Enjoy the pool and hot tub, as this unit is a member of the Amenities Corp, which also includes tennis and workout room access. BUY BOTH TOWNHOMES 5 & 6! Lock off door gives the option to stay in one and rent the other or use both - meaning 7 bedrooms! See MLS # 8296486 to view #6.